I upgraded my ageing Tektronix DS210 scope to Rigol DS1054Z and was rather unpleasantly surprised by the fan noise this thing emits. If you have one, then you know how hugely annoying it is. If you don't yet own one, then lets put it like that - you wont be able to listen to music at sensible levels with this thing running on your desk. It is really bad. The scope itself is not some power-sucking beast that would require huge ventilation, it consumes something like 22W with all 4 channels running. Hard to tell why its designers thought that running the fan at full speed would be a good idea. 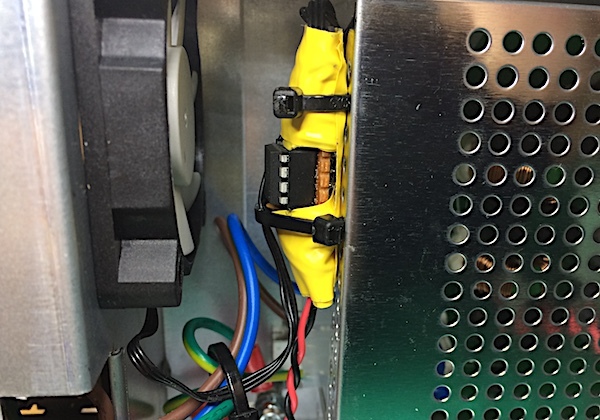 The typical approach is to put a 50 ohm or so resistor in series with fan to reduce its speed, but this may cause problems down the road when the ambient temperature is higher that normal room temperature or when the fan ages and will not start reliably with the resistor in series. For the code, see the ATTiny based pwm fan controller project page. You will need to get the scope open, it will void your warranty. Or you may want to cover your tracks and be very careful with a warranty sticker, see this video by Mike Harrison to learn how to get the sticker off in once piece. You will obviously need to do it again for undoing your mods before sending it in for warranty repair, or just leave a non-sticky paper on it, and tape the paper to scope so that you can easily get it open again. The replacement fan I went for is Fractal Design Silent Series R3 50 mm. Compared to the Sunon fan in the scope it is super quiet, and would be a worthwhile upgrade even without the speed control. When the scope warms up a bit, the fan kicks in and at normal room temperature stays running constantly at relatively low speed. The scope will not be totally quiet like my old fan-less Tektronix TDS210, but with any kind of ambient noise present it will be almost unnoticeable.